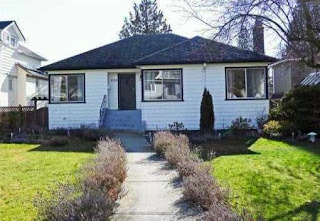 The Thirties Grind blog has an awesome series about the most absurd Vancouver properties, and how much (insane!!) they cost. They wrapped up the year with the The Top 10 Absurd Vancouver Properties of 2013, and if you live anywhere in the Lower Mainland, you will want to read the list. We live in the Valley and are astounded by housing costs out here. I cannot imagine living closer to the City and paying these prices. This is a photo of #5 for $2 million. Yeppers - there are still 5 more beauties to go! is my 3 month old watching too much tv? !